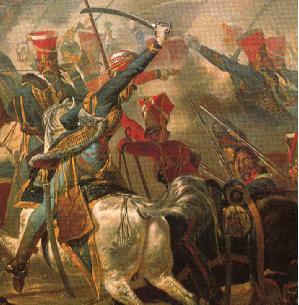 Uxbridge (pointing sword) leading the 10th Hussars at Waterloo. Note that the 10th wore red shakos instead of the fur busby. In the British army, hussars were basically light dragoons in extravagant costumes. 4 light dragoon regiments, the 7th, 10th, 15th and 18th were converted into hussars between 1806 and 1807. In addition to these, there were 3 KGL hussar regiments. All retained their original light dragoon role, only their uniforms changed. Hussars were also required to sport moustaches. During the early part of the Peninsular Wars, the hussars wore their traditional uniforms: ie, tall fur busby , braided dark blue dolman, fur-edged pelisse, sash and either white breeches or grey overalls. The busby was found to be a hindrance on campaign as it did not offer protection against the rain. Worse, it tended to disintegrate when coming into contact with water. They were also top-heavy and affected the rider's balance. By 1813, all Hussar regiments serving in the Peninsula - save the 18th - adopted bell-topped shakos in place of the fur busbys. 7th Regt - white facings, white lace (silver for officers), white sash with blue barrels, white pelisse fur (brown for officers), brown tall fur busby with red bag, changed in early 1813 to a brown peakless shako - from Sept 1813 - blue shako with red band on top. 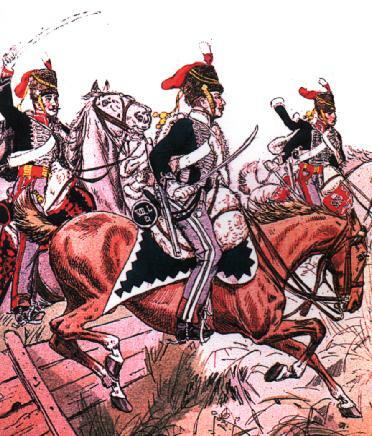 10th Regt - scarlet facings, white lace, crimson sash with yellow barrels, brown? pelisse fur (grey for officers), brown tall fur busby with yellow bag (grey busby with red bag for officers) - from March 1813 - scarlet shako with white? band on top. 15th Regt - scarlet facings, white lace, crimson sash with white barrels, brown pelisse fur for NCOs and officers? (colour for other ranks is unclear), brown tall fur busby with red bag - from March 1813 - scarlet? shako with white? band on top. 18th Regt - white facings, white lace, white sash with blue barrels, grey pelisse fur, black fur busby (brown? busby for officers) with blue bag. 7th Regt - blue facings, yellow lace (gold for officers), white sash with blue barrels, white pelisse fur (brown for officers), brown fur busby with red bag. 10th Regt - blue facings, yellow lace, crimson sash with yellow barrels, black pelisse fur (grey for officers), scarlet shako with white band on top. 15th Regt - scarlet facings, white lace, crimson sash with white barrels, brown pelisse fur for NCOs and officers? (colour for other ranks is unclear). It is unclear if the 15th were wearing busbies or shakos at Waterloo. 1st KGL Hussars - scarlet facings, yellow lace (gold for officers), crimson sash with yellow barrels. Fosten doesn't give any further details. Haythornthwaite depicts an officer wearing a tall black fur busby with red bag and black fur-edged pelisse. 2nd KGL Hussars - white facings, yellow lace, crimson sash with yellow barrels. Fosten depicts an officer wearing a tall brown fur busby with red bag and detachable black peak. The officer's pelisse fur is brown. Haythornthwaite says that the other ranks were similarly attired. 3rd KGL Hussars - yellow facings, white lace, crimson sash with yellow barrels, Fosten doesn't give any further details. Haythornthwaite depicts a trooper wearing the Light Dragoon pattern shako - black with white band on top. The pelisse was edged with white fur. Close-up of an officer of the 10th Hussars at Waterloo. British Hussars as depicted by Knötel . L-R 15th Regt, 7th Regt, 10th Regt. Recent research by Fosten and Haythornthwaite has revealed many regimental variations during the Waterloo campaign. It is unclear if the above illustration is still considered accurate. Reproduced with kind permission of Uniformology.